Public Health Game Night II: The Black Death Escape Room! 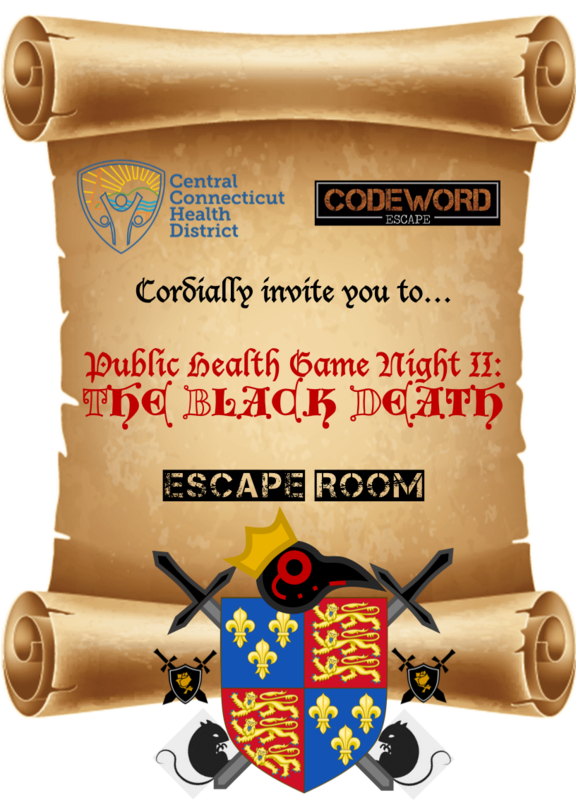 In partnership with Codeword Escape, CCHD will be hosting Public Health Game Night II: The Black Death! on Wednesday April 3rd in honor of NPHW’s Global Health theme. Our second annual Public Health Game Night will feature a multi-room escape room set within England during the devastating 1350’s Black Plague pandemic. King Edward III’s daughter, Joan of England, has been infected on her journey to Castile. The King, taking precautionary measures, has quarantined YOU, his royal guard within his throne room. Hidden deep within the castle lies a cure, inadvertently accessible only by those whom have been locked in. You have one hour to solve the Mad King’s security puzzles to find the coveted hidden cure. Find the cure, save the King’s daughter, and survive the plague as heroes of the realm; fail to do so, and become tragedy as you succumb to the deadly disease! A variant of Codeword Escape’s ‘Curse of the Golden Touch’ escape room, Public Health Game Night’s ‘Black Death’ will present a mediaeval perspective into the origins of Public Health! Come get locked in, conduct an outbreak investigation, track a deadly vector-borne disease, put your public health detective skills to the test, and get a taste of what Public Health has to offer! Space is strictly limited and reservations will be granted on a first come, first served basis. To secure your spot on the team, please email lpantoja@ccthd.org.